We offer lessons and clinics for all ages. Our 20-acre facility can accommodate great birthday parties and corporate events. 5050 Acorn Golf is a family-friendly, pet-friendly driving range and with a unique selection of artisan beers. Our lighted, grass driving range has more than enough room for you and all your friends. Take advantage of our chipping area, bunker and putting green. Take a break with a bucket of beer at our covered picnic tables or watch a game on one of our big screens. Sign up for our private or group golf lessons. We teach all ages from 5 to 99! Private Parties: You can reserve all or part of our 20 acre facility for next event. Call us for details. 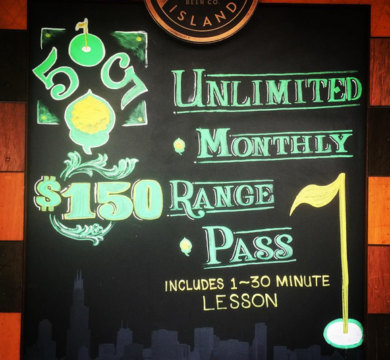 $150 unlimited balls for one month. Real grass. Laser-sighted targets from 65 to 300 yards. Grab a leash and bring the dog(s)! Play catch or just let them hang out with you while you hit balls. We have snacks, bottled water, Gatorade and a great selection of artisan beer. Start out the right way. We have an LPGA Pro here to help you get your game on. Includes 50 minutes of instruction, bucket of balls and video swing analysis. Don’t feel rushed to hit balls and hit the road. We have a playground for the kids and big screen TVs to watch the game. Save on buckets and lessons with our monthly programs. Unlimited range balls for one day. Cannot be shared with anyone. We are a full-service, family-friendly golf practice facility complete with a lighted, grass tee line, a putting green, chipping green and sand trap. Our head golf pro, Janet Robbins, offers both group and private lessons as well as clinics and video swing analysis. We have a fenced playground for kids and a very large fenced dog park. So, there is something for the entire family. Enjoy a refreshing beverage from our extensive craft beer and wine selection, while sitting on our new outdoor deck and watch a beautiful sunset, or hit a bucket of balls. It is a great place to relax outside. 5050 Acorn Golf © 2019.